Chapin students addressed global water access issues faced by their partners students in Central and South America in LUV’s new Global Water Crisis course. Last week in the Middle School, Chapin’s Class 4 science minds explored the water issues facing our world and prepared to work towards creative solutions to solve them. With the guidance of Spanish teacher Ana Agón, the Class 4 students were paired with students in Argentina, Honduras or Nicaragua to learn about the water issues facing these countries before designing their own water-cleaning tools. These unique pairings were the result of the ongoing Science and Spanish STEAM (STEM + Arts) program that is coordinated by Level Up Village and facilitates collaboration between students from around the world. “We’re very lucky that we can turn on a faucet and get all of the fresh, clean water we need. A lot of people in the world can’t do that,” Head of Middle School Science, Mr. Jack Cooley, explained. After discussing the serious issue of water scarcity, the students studied a portable two-stage filtration system known as “LifeStraw” that was created to help people in developing nations with little access to clean water. The handheld device uses charcoal, iodine crystals and membrane filters to remove harmful particles, bacteria and viruses, like cholera and typhoid, from a water supply, and can even be used to safely drink from a lake or stream. At Chapin, students are learning about water scarcity, conducting experiments and designing potential solutions to global water access issues together with global partners students in Argentina, Nicaragua and Honduras. Drawing inspiration from LifeStraw’s design, the Class 4 students worked together to creatively construct their own larger versions of a water filter, using supplies like charcoal, coffee filters, cotton balls, and gravel, and then tested their efficacy by attempting to clean the “dirty water” Mr. Cooley had concocted out of vinegar, lemon juice and cocoa powder. “Now, just because water looks clear doesn’t mean it is clean. We also need to test the pH to make sure that it’s close to 7 – the pH level of our bodies and our drinking water,” Mr. Cooley explained. Once the students’ filters had produced clear water, they used pipettes to take water samples, which were used to conduct pH testing. “They won’t get it right on their first try, but eventually they’ll figure it out. It’s all about trial and error,” Mr. Cooley noted. The importance of experiential practice and the growth mindset is stressed in Chapin’s Middle School classrooms with ‘fail often to succeed sooner’ being one of the main themes of Class 4 science. Once they had success with their larger-scale filter designs, the students tried their hand at using 3D printed mini filters, designed by their partners at Level Up Village, that are small enough to fit over the top of a water bottle. After experimenting with these two filters, the girls thought about what worked well and what they could change to make them better. Using this knowledge, they were charged with the task of designing original 3D solutions for the pressing water issues in their partner countries. 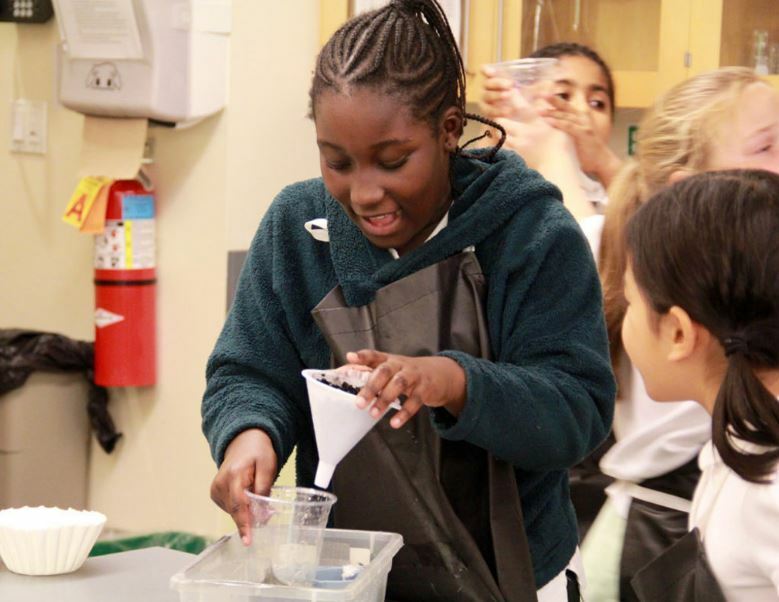 “Fail often to succeed sooner” is one of the main themes in Chapin’s fourth grade science class where students are putting their design skills to the test in LUV’s Global Water Crisis course. “The possibilities are endless,” encouraged Mr. Cooley. 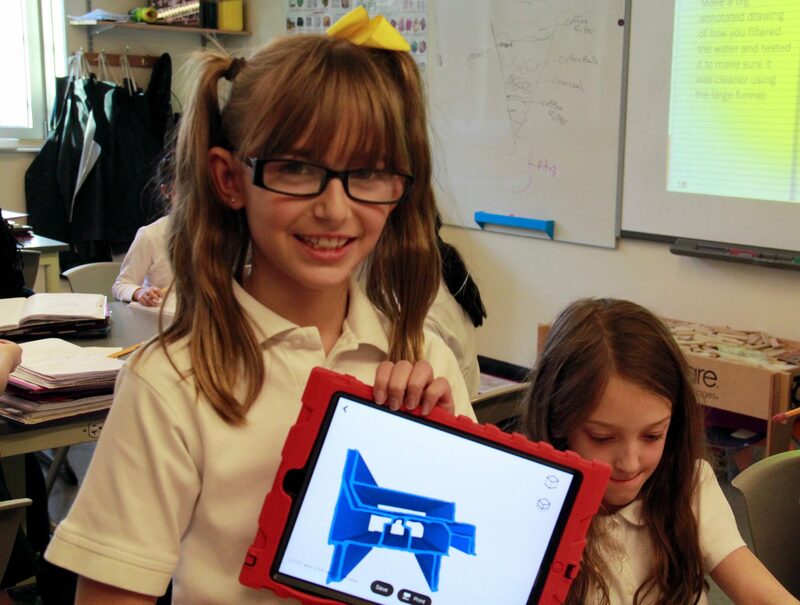 The students’ designs began with detailed, annotated sketches, which they brought to life on laptops and iPads with 3D modeling programs like TinkerCad, PrintShop, Morphi and MakerBot. “I designed a pipe that collects rainwater, filters it, and brings it into the house,” said one student. “I designed a portable filter with a handle that you can carry around with you like a purse,” explained another. “My partner country doesn’t have a lot of water, so I designed a filter that will let them clean and reuse their drain water,” noted a third. With their thoughtful designs ready for presentation, the Class 4 students look forward to sharing their ideas with the students in their partner countries and continuing to work towards creating a world with clean water for everyone. This article was originally published on The Chapin School news page on 12.14.16. See this story about The Chapin’s School first Level Up Village global collaboration (Global Scientists) and this story about the school’s ongoing relationship with its LUV Global Partner in Nicaragua. 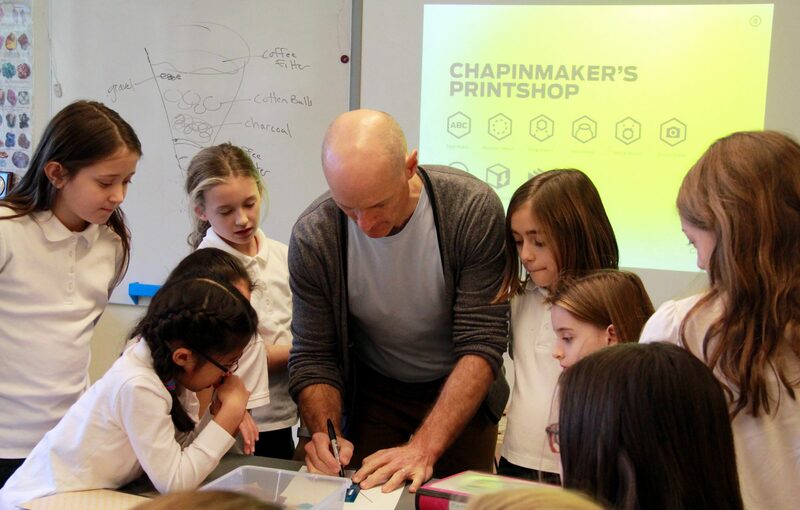 The Chapin School: An all-girls independent school in New York City, The Chapin School prepares a diverse and talented community of young women to thrive and lead in a global society through its dedication to academic excellence, personal integrity and community responsibility.